The Silver Shadows Tea Bowl is Seto Ware from Aichi, Japan. The design was hand-decorated by Zyotetsu Yamaguchi. The Silver Shadows Tea bowl is an artisan Chawan piece. The name Silver Shadows was derived from the distinctly nebulous quality of the bowl, dotted with black and brown flecks of color and brushstrokes. White arrows and lines further add to the charm of the design. 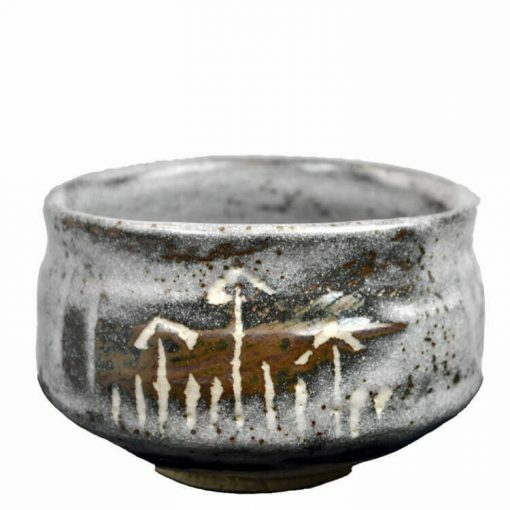 The Silver Shadows Tea Bowl is a Seto Tea Ware item from Aichi Prefecture. This chawan is designed by Zyotetsu Yamaguchi. As the Silver Shadows Tea Bowl is an artisan tea ware piece, it is subject to the artist’s availability. While stocks last.